Unless you’ve been living under a rock, you know what a Ferrari is. The Ferrari name is associated with the highest quality luxury cars designed specifically for speed demons. In the 1980s, even Barbie had a Ferrari convertible! 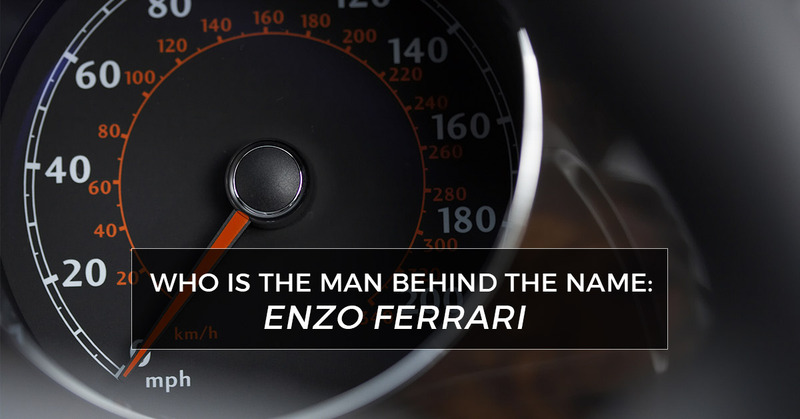 Today, we would like to explore the man behind the Ferrari, Enzo Ferrari. Born on the outskirts of Modena in February in 1898, Enzo Ferrari was first introduced to the world of auto racing when he attended a car race with his father and brother when he was just ten years old. He entered the race car world when he was hired as a test driver for a small race car manufacturer in Turin. Only a year later, Ferrari moved on to racing cars professionally, and Alfa Romeo took notice of his driving skills and hired him. In 1929, Ferrari founded the Scuderia Ferrari, a racing stable that mainly used Alfa Romeo cars. In 1931, Ferrari retired from racing cars and instead became a racing manager for Alfa Romeo until he resigned from the company in 1939 in order to design his own line of racecars, but World War II put his dreams on hold. After the war, Ferrari finally developed his first of many race cars, the Ferrari 125 S. Ferrari’s cars quickly gained international attention after winning countless races, and the company began producing road cars for the wealthy elite. The Ferrari signature horse emblem and name quickly gained legendary status. Here at Leonardo Diagnostic Tools, we love Ferraris and take great pride in our highest quality Ferrari diagnostic tools. Contact us today to learn why we have the best car diagnostic tools for Ferraris!